"Bubbles have, in general, a very magical power," Underwater Bubble Show co-creator Dace Pecolli says, describing her multifaceted circus-inspired show as "a lucky hand." "I've done shows in 59 different countries and met millions and millions of people," she says. "And I have never met anybody who doesn't like bubbles. Bubbles give you this joy when you look at them. You forget troubles and tasks to do, and it comes out automatically somehow." 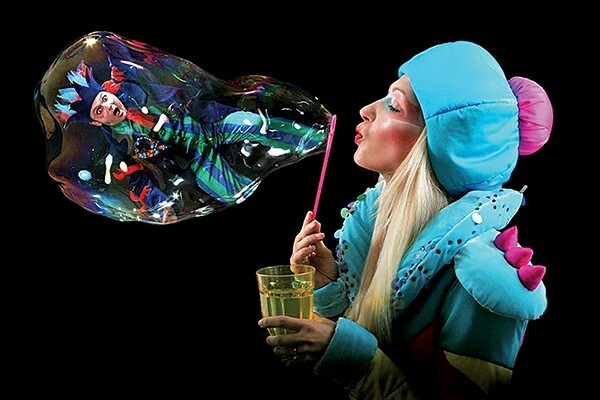 B — Underwater Bubble Show is an interactive, multimedia spectacle, taking audiences to the fantasy world of Bubblelandia, using a mix of stage magic, special effects, and variety performance. It tells the story of B, who's unhappy in his too-busy world and dreams of life in a fishbowl. "If you want to see it more deeply, [the main character] B stops time and looks in himself, and discovers all the beauty and happiness that was there all along," Pecolli says. "But if we want to see lightly, he is daydreaming. It is why some people in offices keep aquariums. "When we see the red fish flying, it gives us calm and joyful feelings," Pecolli says, describing the show's environmental effects. "And everyone will find something different. We have magic, juggling, contortionists, ariel artists, sand painting, and lasers." And soap bubbles. Lots and lots of soap bubbles. "Each of the acts is only three or four minutes long," Pecolli adds, trying to capture the contradictory nature of a fast-paced show designed to slow everybody down.